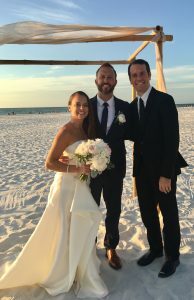 I couldn’t have asked for better weather or a better bride and groom, when I had the privilege of officiating Jeff and Stephanie’s amazing wedding ceremony at Hilton Clearwater Beach. The team at HCWB led by Candice and Brooke, did a fantastic job and provided a first class experience for the bride and groom, vendors and guests for this beachside celebration. Hilton offers an amazing sand ceremony option and outdoor deck for the cocktail hour and or reception. Each overlooks beautiful Clearwater Beach. Lifelong Studios was a pleasure to work with, maneuvering around the ceremony to capture many fantastic moments for the couple and always offering warm and friendly service. Mellow Vibes provided mellow beach friendly sounds, adding to the picture perfect atmosphere. Craig with Grant Hammond did a fantastic job as always, leading the reception vibes. Getting to spend time with Jeff and Stephanie prior to the ceremony, really gave me a feel for them as a couple and a provided me a first hand view of just how in love they truly are.